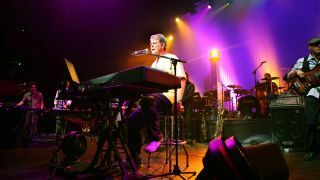 The founder/composer of the original Beach Boys returns to the UK, his 'spiritual home', to perform a specially commissioned suite at the Royal Festival Hall. Over the past few years Beach Boys legend Brian Wilson has been inducted into both the Hollywood Bowl Hall of Fame and the UK Rock Hall of Fame. He’s released his first solo Christmas album and duetted on recordings with Neil Diamond and Burt Bacharach. He’s guested on American TV shows, played with his stellar band in Berlin at Live8, and released a two-song CD to benefit Hurricane Katrina victims. This autumn he returns to play in England, the country he describes as his “spiritual home away from home”. It feels very, very good to have him there right next to me. It’s emotional security. Al got used to playing with us right away. And it’s worked out okay. The band has gotten better and better all the time. Every year they get better and they’re at the point where they are at the absolute best they can get to. I see a bunch of gifted musicians who know how to make that music come alive. It’s a big sound! Every time you perform God Only Knows it brings a standing ovation. Why? Because we’ve had a little practice [laughs]. Second of all, Carl [Wilson, former Beach Boy] is gone. Third, I have to carry what he used to carry. I don’t remember the recording session of it. Too far in the past. The record spoke for itself. And it was a religious experience. Carl and I held prayer sessions in our house on Laurel Way. “Dear God. Please let us bring music to people.” It happened. A lot of people say that Pet Sounds got them through high school or college. Can you tell us about teaming up with lyricist Tony Asher for Pet Sounds? A cool kind of guy. A little more soft-spoken. His attitude is just right for creativity and just right to work with. I might call him up, as a matter of fact. That might be a good bet for me. Just before we began collaborating on Pet Sounds I asked him what it was like writing commercials for an advertising company. It seemed like interesting work. I said: “You should be good with words if you can do that.” And he said: “I’m pretty good with words.” Out of nowhere I said: “Would you like to work with me on some songs and write some lyrics?” “I’ll give it a try.” Then, Pet Sounds. 1966 was a very big year for the Beach Boys. What about collaborating with Van Dyke Parks on SMiLE? Working with him is not easy at all, because he is a perfectionist. So he wants it his way and the right way. I’ve always liked what he’s come up with. That’s the thing. Always. He’s a gentleman and a scholar. A very bright person. Do you remember where you were the first time you heard The Beatles’ I Wanna Hold Your Hand? They didn’t scare me, but made me jealous. Because they got a lot of attention we didn’t get I was so jealous I could have cried. You still enjoy Paul McCartney’s work. Actually, I’m working on a song, Beatleman. I’ve written it with Scott Bennett of my band, and he has a high level of creativity. In a certain way I’m addressing it to Paul. He cried when he saw SMiLE. You debuted SMiLE at London’s Royal Festival Hall, and this summer you premiere a new piece at the same venue. Have you ever really thought about why Britain has become your spiritual second home and why it embraced your work more widely than America did? Because they appreciate good music more than Americans. The music goes to their heart. The people are more in tune with and more grateful to hear music than America. Tell us about the new That Lucky Old Sun (A Narrative), which you’ll debut in London in September. It’s five narrative stories, and That Lucky Old Sun re-occurs five times. Toward the end there’s a one-minute piece, a shorter piece. Quick things. You seem to be really happy performing Good Vibrations on stage these days. Why does it still thrill audiences so much when you play it live? Because the damn thing is so together and cohesive. It comes together so beautifully that people can’t resist loving it. The first time I heard Good Vibrations on the radio I cried my eyes out. How does it feel to be doing selections from _SMiLE now in concert, and even celebrating the accomplishment of SMiLE_ reaching an audience? You know what, I don’t like SMiLE anymore. I got so tired of it and did it so many times that I’ve forgotten the damn thing! I said: “I don’t want to remember it. It’s done.” I like the band I played it with. What happened was I drank soft drinks for five years and it fouled up my sleeping schedule, screwed up my thought process, fucked up my nerves – the sugar and caffeine. Two months ago I got off of it and feel 20 times better. What a lesson to learn. The Beach Boys: An American Band was just released on DVD, with live performances and interview footage with you. Do you like talking about yourself on camera? Yes, I love to. I’m not as shy as I used to be. And I was afraid of people. And I still am. Do you remember the first day you walked into Capitol Records in 1962? Yes. I remember walking into the building with my father and Gary Usher. We met the A&R man, and he listened to our demos and he signed us right on the spot. I just wanted to make records. I didn’t know how big it would get. I didn’t think it would. Brian Wilson actually wrote and originally recorded the instrumental Pet Sounds for a James Bond movie, Dr. No. Back then, though, the tune was called Run James Run.